The mission starts from a phone call from Madame Roget in Kingsmouth. I know, it sounds weird on the phone, right? Look, I wouldn’t call because of some missing cats. I mean yes, my cats ARE missing. But… others are screaming. Rising. Clawing in our heads. I actually miss the ravens. After the cut scene, you’ll have 2 objectives. Objective: Inspect the collar of one of Madame Roget’s cats. Both exist on Madam Roget’s table. I always kept them outside. They did… cat things – rummaging, scratching, digging up flowers. They never bothered anyone. Certainly didn’t bother me. Now… I see them digging things up, but it’s not flowers. It’s definitely not flowers. 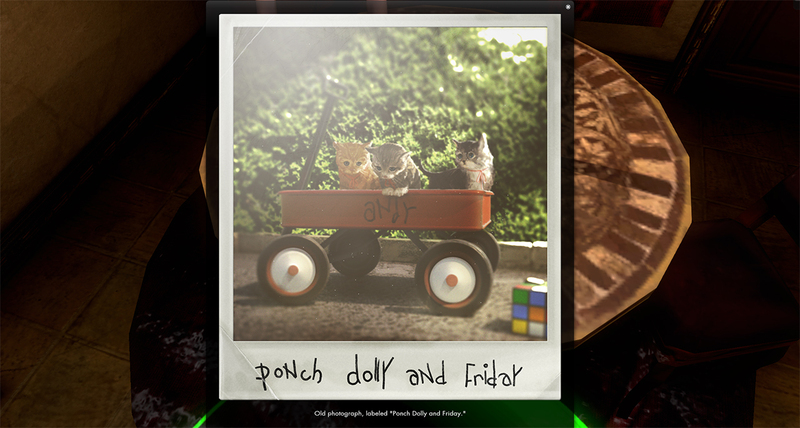 You’ll see 3 cats having a wonderful time… You’ll also come across some seasonal lore! Be sure to grab it! I haven’t been totally honest with Andy. I mean, I’ve left things out. About his kittens … Look, everyone knows they didn’t go quietly. Well, they’re not coming back quietly either. So time to find what’s haunting Andy. Logic would say, along the water, seeing as his poor kitties were drowned. So head to coordinates (706, 420), you’ll see the lore on the boat. But as you approach, you’ll get to meet Andy’s 3 kitten. Dispatch them… again. The thirteen are tied by their tongues. I keep hearing those words. Can you do anything with that? Objective: find the group of thirteen cats on Solomon Island. So.. who else on Solomon Island had a ton of cats… Elanor Franklin, at the Franklin Mansion in Blue Mountain! The mission will update to the next tier when you arrive. 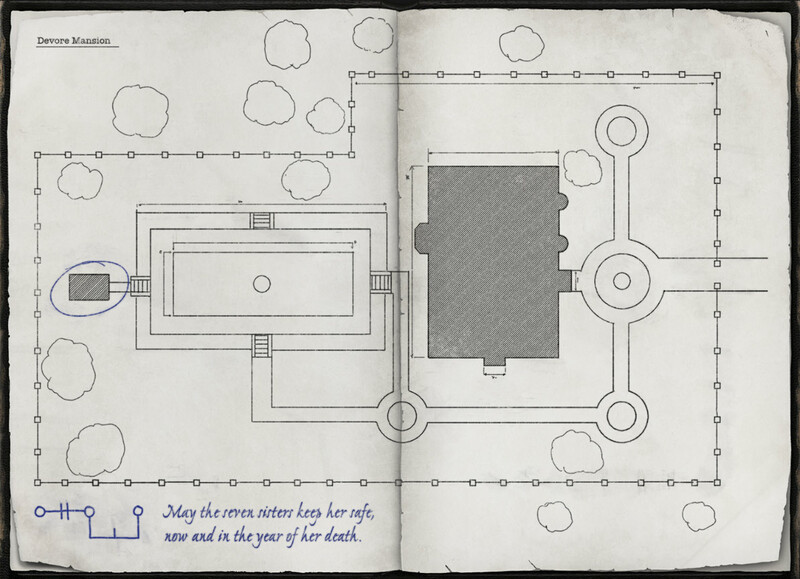 Objective: Search the mansion for a clue to the location of the crypt key. Head back inside the mansion, time to look for a clue .. As you enter the mansion, look to your right… Click the painting. It’ll open a passage way. Once inside, click the book on the floor. Elena Zhelikhovsky paved the way in this town for my line of work. Her spirit’s always been chatty… maybe she knows something we don’t. Head up stairs, in the large room, on the left wall, you’ll see a painting titled “Pleiades” – this painting is also known as “The Seven Sisters” … So matches the clue! Activating the painting presents you with a keypad. Now to find the person in question, and the year of her death, so given the clues, we’re seeking the year Elena Zhelikhovsky died… … Well, in the lore, Elena Zhelikhovsky died in a car wreck in 1957. You get attacked by Incognito, fight him after a short while, he runs off. Continue onward to the bottom of the crypt. IMPORTANT: Don’t be a Volaric and forget the lore in the back of this room. If you do, you’ll not be able to re-enter once the mission is complete and deprive yourself of the Harvester of Horror AND Hop-tu-naa, Trol-la-laa achievements! Objective: Uncover what the spirit has to say. Sweet is the halloween stuff up? On our site? Yes. On the actual game… Got pushed back to the 18th. … Normal Map? Assuming you’re new to the game (not a bad thing!) but, these missions really assume you’re a character further along. Funcom designed them with existing players in mind for sure, not so much for the new folks. So, If you’re in Kingsmouth, you’ll need to head through the Savage Coast and then on to Blue Mountain. Truthfully, the references and clues around the mission, as well as the follow up mission, are impossible for somebody who hasn’t advanced through the main story. The Incognito fight seems to be either random, or one-time thing. I met Incognito guy back in Kingsmouth zone, just southeast of the scrapyard – fought him, got a bag and a pumpkin hat – then proceeded to kill Andy’s kittens, headed south, got to the tomb, and found no Incognito there. Nice guide as ever 🙂 For the part of the quest where you have to find Andy’s kittens, if you go talk to him on the roof of the Sheriff’s Office he’ll tell you exactly where his nasty Dad drowned those cute kittens. I`ve been away from SW for quite a long time, so i have a question – as far as halloween event ended, i cant do this mission any more? That is correct. Not sure if they’ll re-enable it next year, or give us something new to do.